The last climbing spot on our cycling and climbing trip was Geyikbayiri, close to Antalya in Turkey. And it was clearly our highlight and a superb final end before we would hit the road in Africa. 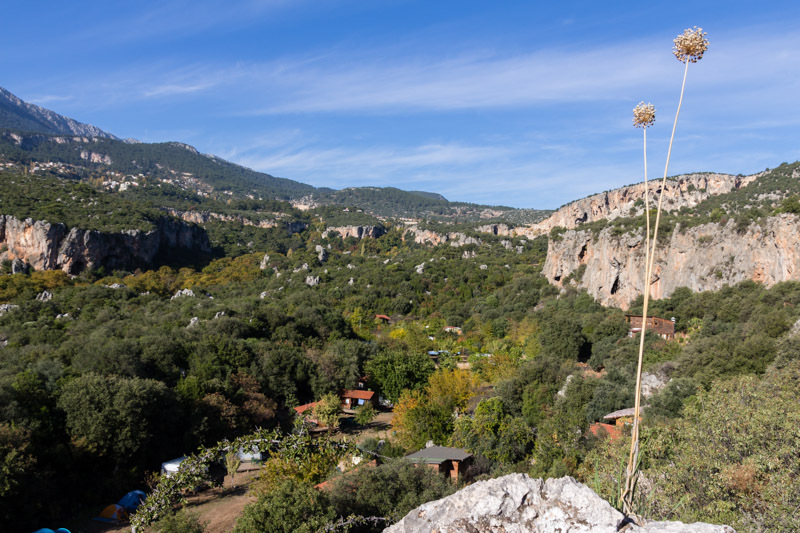 The climbing around the small village Geyikbayiri just has everything: perfect rock, perfect routes in different styles and grades, it is possible to climb in basically any weather and an awesome community. This community was the reason we stayed a bit longer. It is so nice to just relax or cook together after a long day climbing. During the evening, everyone sits around the campfire and talks almost non stop about climbing. This atmosphere was so much fun and pushed everyone to climb more and harder stuff. For cyclists the approach to the climbing area is hard as it is 500m up. At least you can walk in Geyikbayiri everywhere and don’t need the bikes any more as soon as you are up there. 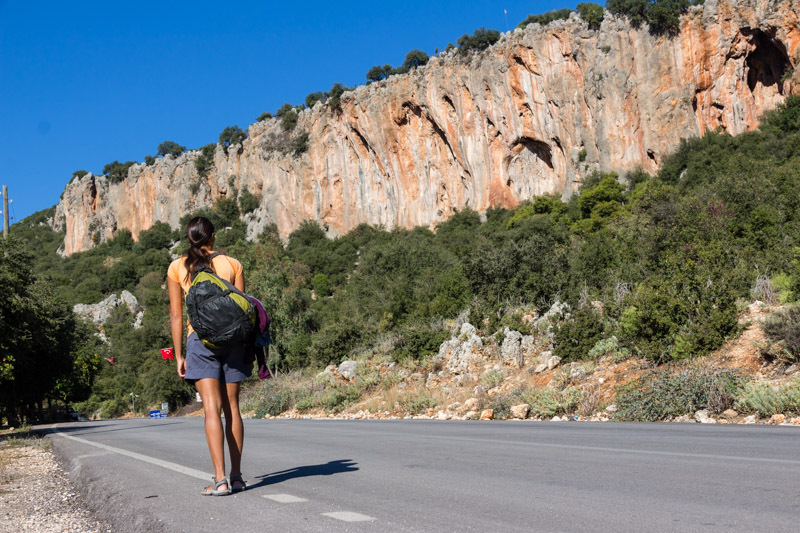 If you want to read more about our climbing adventures around Antalya check out our blog post. Beautiful limestone climbing walls in Geyikbayiri, close to Antalya in Turkey. Rock and routes: Geyikbayiri has lots of different sectors, which offer different styles. The majority of routes are athletic and powerful overhanging tufa routes. It feels like ‘real’ 3D climbing, as sometimes you have holds and walls all around you. 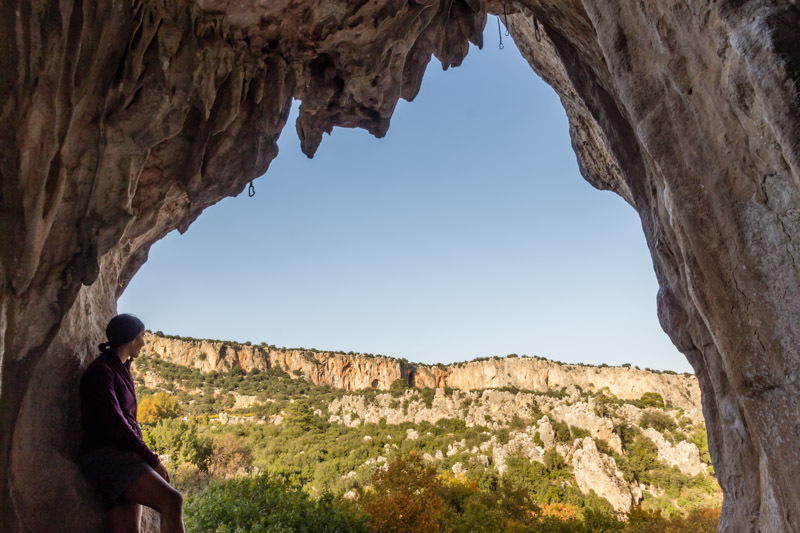 Climbing area and environment: The scenic valley of Geyikbayiri offers beautiful views over untouched nature or even down to the large city of Antalya. On clear days it is also possible to see the Mediterranean Sea. All crags can be reached by foot from most of the campsites and the base of the wall is usually very comfortable. Guide book and information: The guidebook ‘A Rock Climbing Guidebook for Antalya’ by Öztürk Kayıkcı includes all routes as clear and detailed topos. Regular updates are published on the web, as new routes are added every year. There are not too many routes below 6a, but lots and lots of hard routes in the French 6th and 7th grade. On top of that also lots of routes in the 8th grade can be found. Summer is too hot to climb, even in the shade, so winter is best. However, autumn and spring are also great seasons and it might be less busy. As there are so many different crags, you can always find the perfect spot. Either in the sun (Sector Sarkit, Turkish Standard…), shade or even protected by the rain (Sector Trebenna, Left Cave). So the weather is no excuse to not climb in Geyikbayiri. View from the climbing sector Trebenna in Geyikbayiri, which is very shady and also protected by the rain. 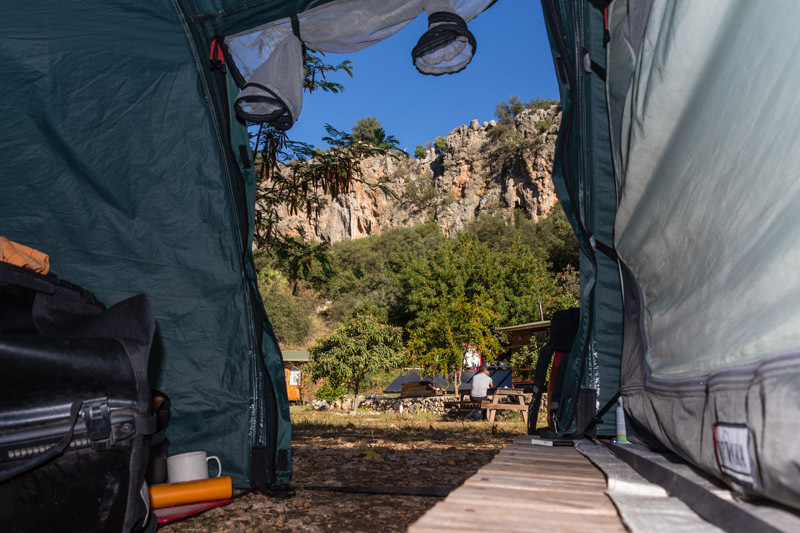 Accommodation: Geyikbayiri has plenty of option to stay, either on campsites or guest houses. We stayed at the JoSiTo campsite (www.josito.de), which provides good and clean sanitary facilities with great hot showers as well as a community kitchen. The campsite also offers great food, especially on pizza night! Access to food: Buying food can be a bit difficult in Geyikbayiri as only basic supplies are available. The campsite JoSiTo can provide breakfast an dinner, so this could be one option, but rather a pricey option. We usually went down the hill to the next village called Akdamlar, which has a great market on Sunday with tons of fresh fruits, vegetables and other stuff to survive. Hitch hiking is very common and it is no problem to get a lift down and up the hill. Access to water: Running water at the campsite, so no problem. Access by bike: Cycling up to Geyikbayiri is hard! It is a 500m hill, with some steep sections. We had to push the bike for quite a bit. However, as soon as you reach the campsite you don’t need the bike any more and you can reach the climbing crags by foot, or hitch hike down the hill to buy food. The valley of Geyikbayiri overlooking the campsite JoSiTo. Looking out of the tent at the campsite JoSiTo and seeing directly the climbing walls.